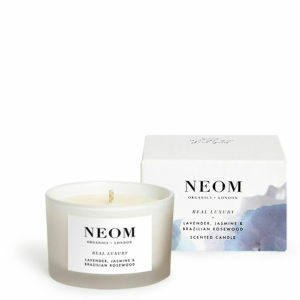 Combining a carefully selected range of stress busting products, the Neom Essential De-Stress Kit has been designed to help you unwind and relieve tension. Enriched with twenty four essential oils, including lavender, jasmine and Brazilian rosewood to de-stress the mind and body, each product will help melt away your troubles. - K.N. A calming spritz designed to relieve stress and tension. Light yet powerful, the on-the-go tension reliever combines twenty four essential oils to banish stress and daily troubles. Simply spritz over the skin and face. Small and mighty, the mist will last up to one hundred applications. - K.N. An intense pulse point therapy designed to de-stress your life. Light yet powerful, the calming formula combines twenty four essential oils to banish stress and daily troubles. Simply apply to the wrists, behind the ears and soles of feet to melt away your troubles. Lasts on the skin for up to three hours. - K.N. A relieving, light mist designed to eradicate stress. Its blend of twenty four essential oils banish stress and daily troubles. Simply spritz over cushions, sofas and linens to impart a lingering, stress relieving aroma in your home. Käytä hoitoon viisi minuuttia, mieluiten rauhallisessa paikassa. Vaihe 1: Suihkuta pääsi alla olevalle tyynylle tai kankaalle Neom De-Stress Home Mist -suihketta. Vaihe 2: Sipaise Neom Intensive Stress Relief Treatment -tuotetta ranteissa, ohimoilla ja korvien takana oleviin pulssipisteisiin. Vaihe 3: Suihkuta Neom De-Stress On The Go Mist -suihketta yllesi pilveksi ja hengitä samalla sisään nenän kautta 7 sekuntia ja hitaasti ulos suun kautta 11 sekuntia. Nauti seesteisyyden tunteesta, joka virtaa kehosi läpi. Toista ja nauti niin usein kuin haluat.